This model is not currently functional. Corticotropin-releaseing hormone (CRH) is an important regulator of adrenocorticotropin (ACTH) secretion from the pituitary corticotroph cells. CRH induces the secretion of ACTH through the actication of the cAMP second messenger system, which results in the activation of protein kinase A (PKA). Secretion of ACTH alo requires an influx of Ca2+, which occurs mainly through voltage-sensitive Ca2+ channels. Corticotrophs generate both spontaneous and CRG-induced action potentials. L-type voltage-sensitive Ca2+ channels are the main channel type that underlie Ca2+-induced action potential generation. It is likely that following activation by CRH, PKA phosphorylates the L-type channel and promotes Ca2+ action potential generation with subsequent Ca2+ influx. The rise in the intracellular concentration of Ca2+ ([Ca2+]i), then leads to the activation of exocytotic pathways, resulting in the secretion of ACTH. Although the PKA-induced action potential activity is known to play an important role in this secretory pathway, the mechanism by which PKA activates the L-type Ca2+ channel is currently unknown. In the publication described here, LeBeau et al. investigate PKA regulation of the L-type Ca2+ channel. They develop a Hodgkin-Huxley-type mathematical model of action potential generation in corticotrophs (see the figure below). 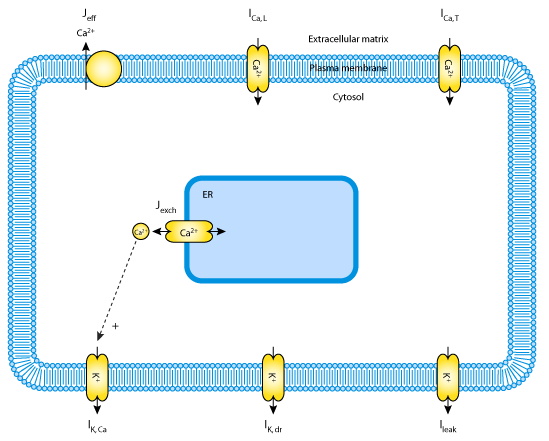 The model includes descriptions of four plasma membrane ionic channels, which allows the analysis of the roles of each channel type in corticotroph electrical responses. Using model simulations, the authors found that an increase in the L-type Ca2+ current was sufficient to generate action potentials from a previously resting state. The favoured mechanism which was thought to underlie this increase in the L-type Ca2+ current was a shift in the voltage-dependence of the current towards more negative potentials. The model also showed that the T-type Ca2+ current plays a role in establishing the excitability of the plasma membrane, but it doesn't plauy a major role in action potential generation. Derived from workspace Lebeau, Robson, Mckinnon, Donald, Sneyd, 1997 at changeset 579331cd183f.